The 61st Regiment of Foot was derived from the 2nd/3rd Regiment of Foot. The 2nd Battalion was raised in 1756, but two years later became an independent regiment as the 61st Regiment of Foot. In 1782, the 61st gained its territorial affiliation with South Gloucestershire to become The 61st (South Gloucestershire) Regiment. On 1 July 1881, it amalgamated with the 28th (North Gloucestershire) Regiment to become the second Battalion of the Gloucestershire Regiment. May 1803 The 1st/61st Foot arrived from Egypt. It replaced the 13th (1st Somersetshire) Regiment. The regiment had 708 men. 1 Sep 1804 Strength: 30 Commissioned and Warrant Officers, 76 NCOs, 667 rank and file fit for duty, 64 rank and file sick, 847 total officers and men, 1116 establishment. 1804 A trial of a soldier of the 61st for murder, resulted in a dispute between the Civil and Military authorities as to who had jurisdiction over him. 1 July 1805 Strength: 28 Commissioned and Warrant Officers, 76 NCOs, 1045 rank and file fit for duty, 58 rank and file sick, 1219 total officers and men, 1116 establishment. 1 Aug Strength: 31 Commissioned and Warrant Officers, 76 NCOs, 1084 rank and file fit for duty, 28 rank and file sick, 1228 total officers and men, 1116 establishment. 1 Nov Strength: 1219 men of whom 58 sick and 1045 fit for duty. 3 Nov 1805 The 1st/61st embarked on Gen Sir John Craig's Expedition to Naples. 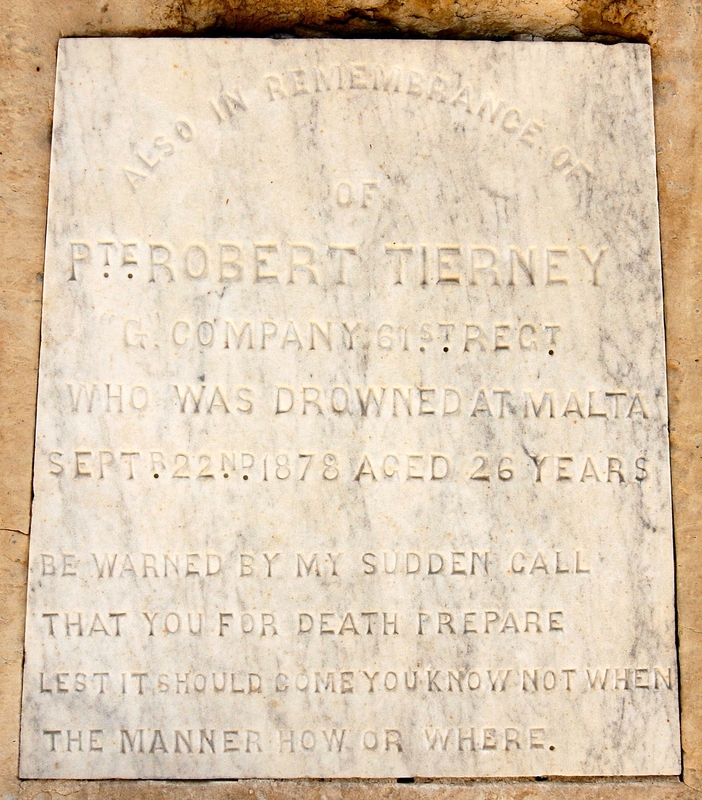 Pte Robert Tierney G Coy aged 26 yrs drowned on 22 Sept 1878. The 1st/61st Foot embarked at Portsmouth from Dover on 9 February. It disembarked at Malta on 20 February 1878. The 61st Foot had an average strength of 680 men. It had 694 admissions (1020.6/1000 mean strength) into hospital with 11 deaths (16.18 deaths/1000 mean strength). 35 invalids were returned to England. Its average constantly sick was 39.10 (57.37/1000 mean strength). The average sick time to each soldier was 20.99 days. The average duration of cases of sickness was 20.56 days. The 1st/61st had a large number of admissions from febricula and simple continued fevers. The 61st Regiment had an average strength of 673 men. It had 549 admissions (815.8/1000 mean strength) into hospital with 3 deaths (4.46/1000 mean strength). 25 invalids were returned to England. Its average daily sick was 30.16 (44.81/1000 mean strength). The average sick time to each soldier was 16.36 days. The average duration of cases of sickness was 20.05 days. Four men drowned during the year. The 61st Foot had an average strength of 407 men. It had 322 admissions (791.1/1000 mean strength) into hospital with 3 deaths (7.37 deaths/1000 mean strength). 8 invalids returned to England. Its average constantly sick was 19.51 (47.93/1000 mean strength). The average sick time to each soldier was 17.54 days. The average duration of cases of sickness was 22.18 days. 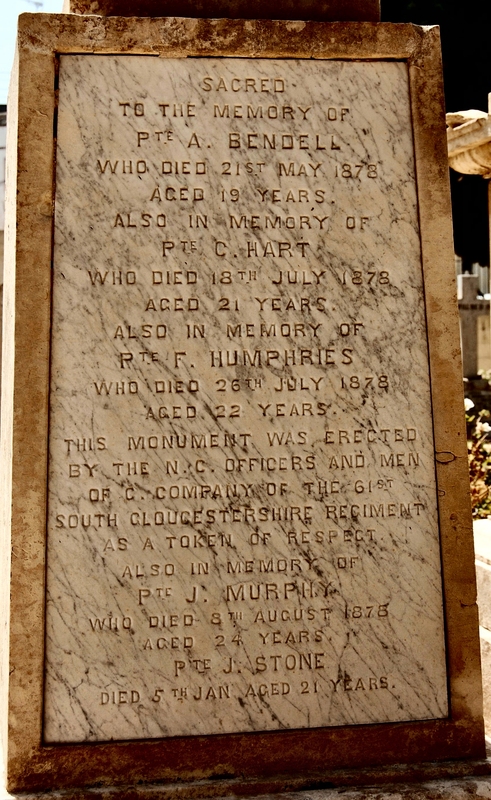 19 Aug – 1 Sep 1880 The 61st (South Gloucestershire) Regiment left for Bombay. 1Military and Naval Medical Services Br Med J (1882) 359, (Published 11 March 1882). 2Quill R. H., Remarks on the movement of troops. Br Med J (1882), 1; 1106, 359 (Published 11 March 1882).